When Will The Snow Arrive: Rains will changeover to snow during the 2 am - 6 am time frame with accumulations in the 1"-2" range by daylight. Some of the higher elevations to our northeast may see a bit more. Road conditions will be hazardous in the morning hours. Snow continues on Monday with another inch possible by Monday evening. Total storm accumulations will range from 2"-4". 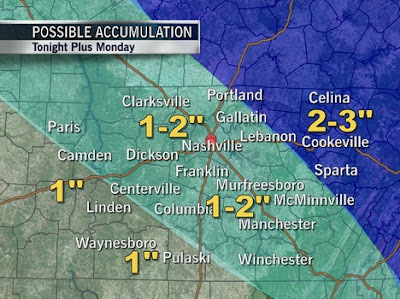 The graphic below is from our friends at NashvilleWX (a weather blog of News 2, the ABC affiliate in Nashville, TN). Monday's Forecast: After a brief snow event in the early morning hours, look for the cold front to pass through in the morning with strong winds cutting our 'feels like' down into the teens. Winds should settle down later in the day as more snow returns. An additional inch is possible. Monday night is expected to very cold with lows in the middle teens. Any precipitation that melts tomorrow will refreeze Monday night. Another cold week ahead with continuing much-below normal temperatures.